Mary Belle Andrews age 92 of Garrett, IN died Sunday, May 25, 2008 in Saginaw, MI. 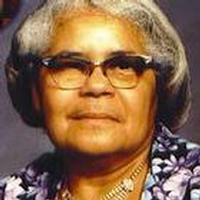 She was born December 13, 1915 in Newton, AL to Robert Haywood and Dovie Mae (Thompson) Doster. She married John T. Andrews on June 11, 1931 in Garrett, IN and he died August 24, 1999. She worked in domestic service for many Garrett families. The visitation and services will be private. Memorials to the Kidney Foundation in memory of Raymond E. Andrews.